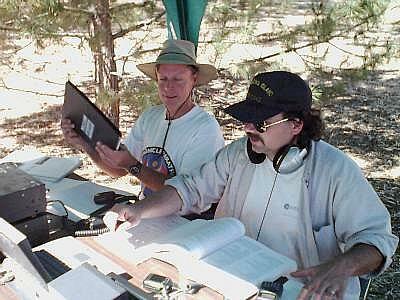 Early Saturday afternoon: Kitty, WB8TDA (left) works CW while David, KD6WRG (right) logs. 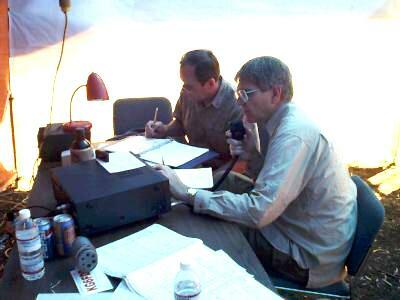 You can see the computer monitor (left) used for the SSTV and APRS demos as well as 47 PSK31 contacts. 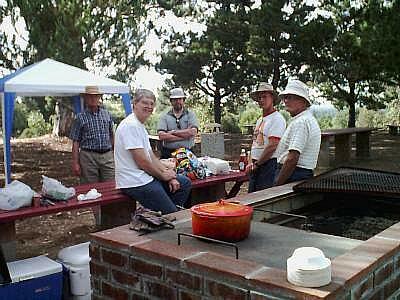 Early Saturday evening: Peter, WA6VAQ (left) prepares the grill for the barbeque with help from Paul, AA6PZ (middle), and Jack, WA6YJR (right). The orange pot in the foreground contains chili brought by David, KD6WRG. Saturday evening: ?? 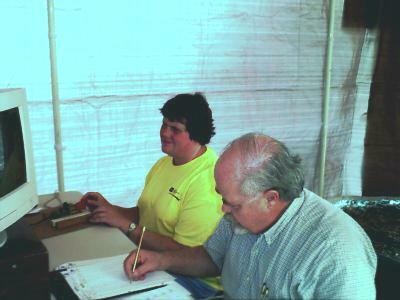 (right) works the SSB station on a roll on 20 meters while Dennis, KC6PUN (left) logs. 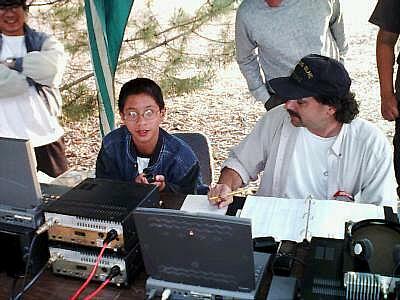 Saturday evening: Phil, KA6MZE (right) helps a new ham Vinh, KG6GXR, (left) work contacts on VHF and get credit for his Boy Scout merit badge, while dad (Truong KG6GRQ) (far left), watches with pride. 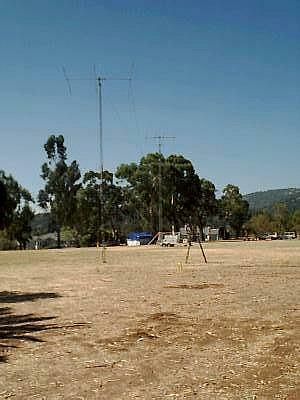 A view of the CW and SSB antenna towers from the CW tent. Between the trees on the left you can see a house as civilization slowly enchroaches on our Field Day site. 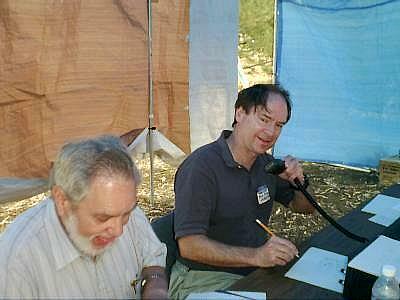 Peter, WA6VAQ works SSB (right front) while ?? (left rear) logs. Notice all the beverage containers as the operators try to keep their cool with temperatures in the 90's. 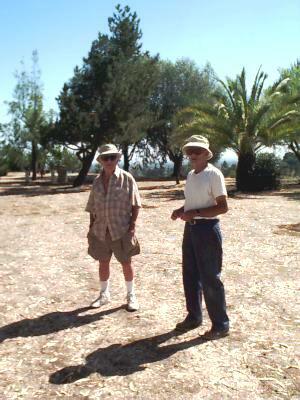 Paul Zander, AA6PZ (left) and Phil, KA6MZE (right) prepare to work another Amateur Radio Satellite. 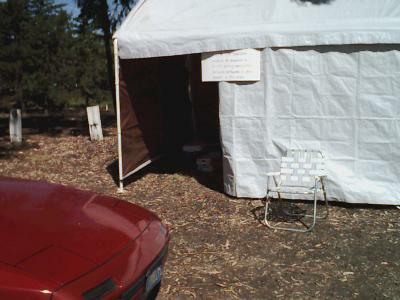 CW station tent. The sign on the entry explains that amateur radio operators help out in disasters. 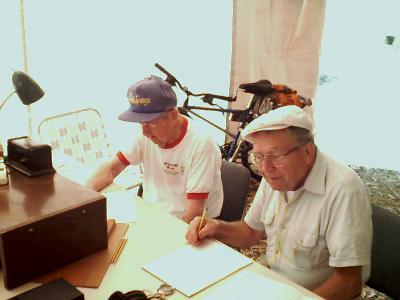 Sunday morning: Walt, W6ASH (left) works CW while Hans, KE6TGA (right) logs. Han's ever-present environmentally-friendly transportation device can be seen in the background. Sunday morning: Charlie, KF6CUU (left) and Jack, WA6YJR (right) discuss plans for takedown. Next to the palm tree you can see the Port-a-Potty that almost didn't make it. They swore we never ordered it. 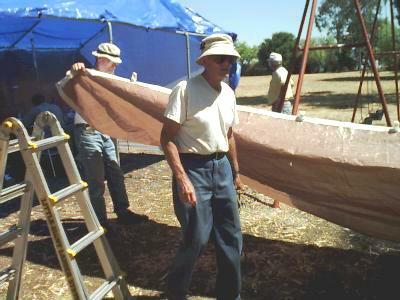 Just minutes left to go: Herb, KF6BKL (left) begins folding a section of the SSB tent while Jack, WA6JYR (front) moves onto another task. You can see an SSB operator still working in the tent. Photos Copyright (C) 2001 by Mikel Lechner, KN6QI.